The following article was originally posted on Tuesday, April 3, 2012 on Workopolis. Consider this scenario: an employee is on a marathon troubleshooting session with a customer on the phone. She hears him tell someone in the background that he’s getting hungry. So this employee puts the customer on hold, and orders him a pizza. The customer’s doorbell rings 30 minutes later while he’s still on the phone, and much to his surprise and delight, there’s his pizza. This customer service “wow” came from a Rackspace employee and it was cited recently in a Harvard Business Review blog post by Fred Reichheld, who discussed the value of such “frugal wows” to a company. Wouldn’t we all want employees like that working on our team? Of course. The challenge is, how to we find these great workers? Often, a targeted interviewing strategy can help identify these candidates. What sets this Rackspace employee apart from the rest, is her intrinsic motivation to exceed her customers’ expectation. She saw an opportunity and seized it with a simple, cost-effective, yet creative solution. The way in which a candidate answers questions about their customer service approach, reveals a lot about their motivations. Ask candidates how they define customer service. Many interviewees will provide “canned” answers, but a personalized, heartfelt response will better reveal someone’s passion for helping people. This is key because passion is something people either have, or they don’t. You cannot train someone to be passionate. I always ask job candidates, “What job would make you excited to get up and go to work in the morning?” Sometimes, the response I get is, “Any job, I’m happy to do anything.” I know they are being honest with me because they need to put food on the table. But companies today don’t want workers, they want motivated company ambassadors, who excel at their jobs because they hone their skills at work with passion. Would a qualified receptionist be happy working in a mailroom with limited day-to-day contact with clients? 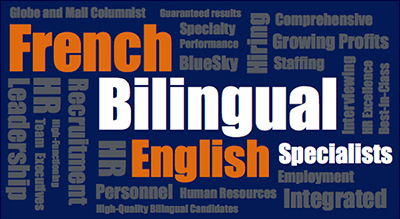 Would bilingual French/English sales representatives be happy in a role where they don’t utilize their language skills? We all have a calling job-wise and for some, customer service is it. Tell me about a time when you had to troubleshoot a problem, and work me through your process and outcome. Did the candidate need someone else’s help to resolve the issue? Did they think creatively on their own or get boxed in with established protocols? Were they more focused on helping the customer or helping themselves to get out of the situation? Give me an example of something that made you mad in your last position. This question uses reverse psychology to discover more about someone’s passions and working style. What’s important to this candidate – people management, work protocols, doing versus delegating, freedom and independence, etc.? Describe a recurring problem within your last company, and explain how you addressed the issue. See how they fixed the problem. Did they use the same technique as others, or did they veer away from the status quo? These questions will help you to find not just good people, but the right people for customer service-oriented jobs. People with this calling thrive best in environments where they have the freedom and flexibility to make decisions on their own. They often feel suffocated in micromanaged environments, and want a trusting workplace with an empowering culture that values unconventional thinking and risk-taking for the sake of the customer. Give these “wow-thinking” candidates the right work environment, and watch them soar.